TomTom have been around on the Pocket PC GPS scene for quite some time now and have a very good reputation for their software. TomTom is the new trading name for Palmtop (Netherlands), who have brought great products to the forefront of the GPS scene like RoutePlanner, RoutePlanner Millenium and CityMaps. We reviewed TomTom maps recently and this review can be found under the Pocket GPS Reviews section of Pocket GPS. TomTom have not only created unrivalled GPS Software which is currently the pick of most GPS users, but now they have also created what can only be classed as the ultimate GPS Hardware/Software bundle. TomTom Navigator (same name as the software) is not only a reasonably priced complete GPS product, but TomTom have really thought long and hard about what they are going to include with their product. Okay, so what have they included in the box ? 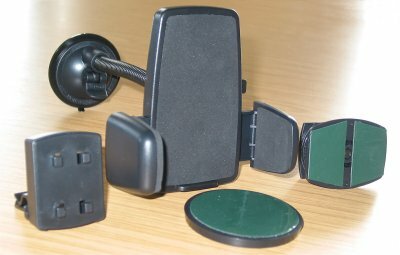 TomTom Navigator Software CD, a universal PDA Mount, a windscreen suction mount with a huge suction cup to stop it falling off the windscreen, a vent mount, a dashboard sticky mount, and also a windscreen sticky mount if you'd prefer not to use a suction cup. This has to be the most complete GPS product on the market today, and we have to commend TomTom for thinking about what the average user may want or even require in their vehicle. Immediately when you take the hardware out of the box, quality springs tom mind in every part of the product, no flimsy plastic! The cradle looks very smart, and is the most attractive looking PDA cradle we have seen so far. 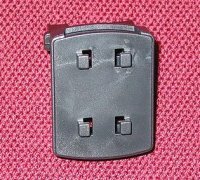 Will my Pocket PC fit the mount ? We've tried a large combination of Pocket PC's and iPAQ sleeves including Casio E105, Casio E125, Compaq iPAQ 3630 naked, with CF sleeve, with PC Card Sleeve and also a 3850 with PC Card sleeve, and all these combinations work well. There should be no need to use the dual PC Card Sleeve with the TomTom Navigator as you are not taking up a CF or PC Card socket, TomTom Navigator plugs effortlessly into the ActiveSync port (Serial socket) and not only provides GPS signals to the Pocket PC, but also powers the Pocket PC at the same time! The Navigator mount has a large suction cup on the end of the mount arm, and we must say is the biggest suction cup we've seen to date. There's no worry whatsoever of this falling off the windscreen every five minutes! One problem we have noticed and that is when the mount has been left in hot sunlight in-car for a short period of time, the rubbery sponge sidings that protect your Pocket PC from being scratched and also aid in gripping the Pocket PC, tend to go a little soft, and because there's nothing to stop the Pocket PC from sliding out the bottom, you might notice the Pocket PC sliding or moving in the cradle slightly. What we did here was to prop the bottom corner of the iPAQ up against the dashboard which aided in resolving this from happening. 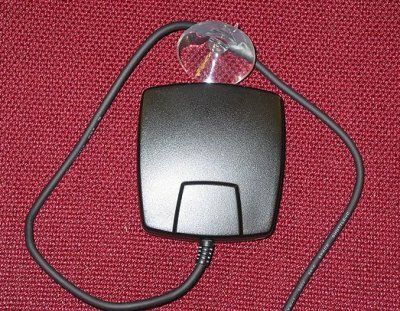 Most companies do say with the windscreen mounts that you should rest them on the dashboard, but with Navigator's serial connector, it does make this a little tricky. The biggest Suction Cup we've ever seen. Look, it's wider than the cradle! When you open the Navigator box, it's just like opening Pandora's box, there's a plethora of fixtures and fittings that can be used to secure your Pocket PC to the car's windscreen, dashboard and car's air vents. TomTom have thought of everything here. Here you'll see the air vent mount. This is totally adjustable, the long arms (fig 1) that go into the air vent, can be moved from the bottom where they are shown now (fig 3), to the middle or to the top of this mount, giving you a perfect fitting. You'll also notice on the bottom horizontal foot (fig 1) at the left there is a square block. This can be moved left to right to move it along the clip to allow for a tighter and snugger fit against your air vent. Pure ingenious! TomTom have really done their research here when it comes to in-car fitments, and have set the standard for other companies to follow! You'll see from (fig 2) the front view of the air vent mount. 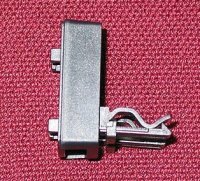 This has a 4-way locking system that locks onto the back of the Navigator cradle, and is a very tough lock with a solid click at the end of it once you've locked it in place. This makes sure that the whole mount will not come apart when driving over potholes in the road, or driving down those rickety country lanes. 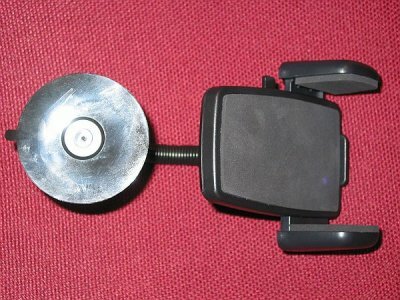 If you don't feel secure in using either the air vent mount, or the windscreen mount as you've had bad problems with suction mounts falling off the windscreen with other products, you can use the suction cup onto the bottom of the disc pictured right and then use the industrial strength adhesive to stick to the windscreen. You can also do the same thing with the far right hand mount in this photo as this will allow you to stick the mount again to a window, or to the dash board and has a ball joint that allows you to angle the mount. Pictured right is the GPS receiver. Again TomTom have thought about this very carefully. Place a block like this on the dashboard, take a tight corner, or drive around a roundabout, and what happens ? Before you know it you'll find the receiver over the other side of the car, or perhaps even on the floor. If you were to stop suddenly in an accident, who knows how badly your face will be deformed ? TomTom with this in mind decided to put an ingenious suction cup and mould it around the cable, so the suction cup can slide up and down the cable if you use a little force. This allows you to suction the cable to the windscreen stopping the GPS Receiver (which really is the most expensive part here) from slipping and sliding around your dashboard doing untold damage. 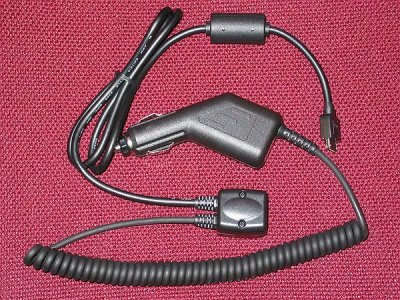 TomTom like many other GPS companies have decided to supply a Y-type cable adaptor. You see the moulded accessory plug. The cable then extends in a coil to avoid a tangled cable to the Y-socket. 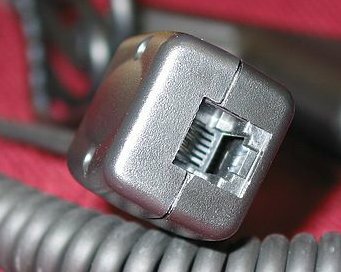 The cable that comes out of this on the same side is the Serial cable that plugs into your Pocket PC and there are several feet of cable here allowing you to position the Pocket PC virtually anywhere in the front of the car. 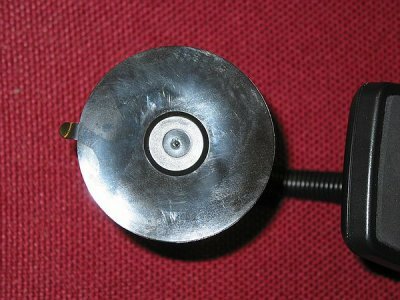 The block you see on the cable houses ferrite, which is a known filter for electrical interference and will help avoid receiving electrical interference from other nearby cables. 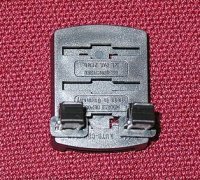 The bottom end of the Y-adaptor is where you plug in the lead that comes from the GPS Receiver (shown below). 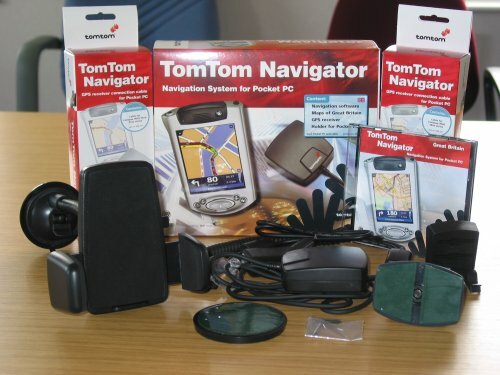 You have now seen the complete kit that TomTom Navigator ships with, so how does it perform ? Quite simply, like magic! TomTom Navigator is the FASTEST GPS receiver we have had the pleasure to test. In tests over a 3 week period, we have been consistently seeing an average of 10 seconds between power on and receiving a 5+ satellite fix and this is when the unit is cold and hasn't been powered on for 8+ hours. The TomTom Receiver has had extended times receiving fixes when weather has been problematic, but this has only extended to the 30 second mark. We have even been surprised on a number of times where Navigator will receive a cold fix in under 3 seconds! How does this really compare ? Well the Navman GPS 3000 with the same software will acquire a fix on average within 2mins 30 seconds, sometimes you will see an extended fix up to 5 minutes, and a quicker fix at around 45 seconds. The Pretec GPS Compact Flash Receiver we found an average fix at cold of around 30 seconds, which can be extended up to 2 minutes, so Navigator really does the job! Thanks to TomTom Navigator, we have found ourselves not waiting like lemons in the car before the first fix is acquired, and are able to pretty much start the car, start to drive away and the fix is acquired. If anyone is suffering from extended TTFF's, then you will notice a HUGE difference going to one of the newer GPS Receivers like TomTom Navigator. What drivers were we using ? We've been using the drivers (1.36) from TomTom, with Navigator and these work perfectly. We did try using other GPS Software with TomTom Navigator Receiver, however most of the GPS Software do not support COM1 (Serial) which means if you want to mix and match the software between the GPS Receiver, you may have a few difficulties until other companies update their drivers to take into account the Serial sync port. The unit is quite neat and sits nicely on the dashboard, but like many GPS Receivers, cables are a problem, and having one cable coming from the Receiver, and 3 cables going into the Y-Adaptor means you do have a lot of cables in-car which are difficult to conceal! If neatness of cables is an issue with you, then TomTom Navigator might not be your first choice of GPS Receiver, however if you want a fast, efficient GPS Receiver that has no loss of signal when driving under trees or in cities like London with close and tall buildings, then TomTom Navigator is the ideal solution! To prove that TomTom Navigator is a good product, I decided to put my money where my mouth is and have purchased the full Navigator product myself and am now using this in-car as my primary GPS Receiver! 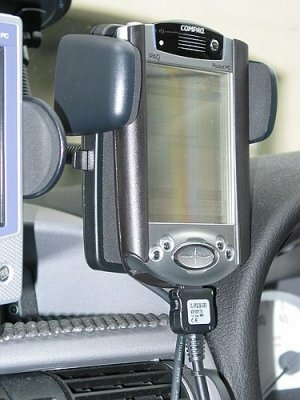 TomTom Navigator is an affordable and easy-to-use navigation system for Pocket PC handheld computers. 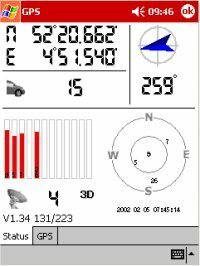 The system can be used in the car in combination with a GPS receiver. It can also be used without a GPS receiver as an electronic mapping product when away from your car. TomTom Navigator is designed for use with powerful Microsoft� Windows� Powered Pocket PC handheld computers. The Navigator software works alongside a Global Positioning System (GPS) receiver to ensure that you find your destination and accurately plan your route. The TomTom Navigator software includes a completely digitised roadmap system. Working together with an extremely precise GPS receiver, which uses satellites to indicate your position automatically, the software frequently updates you as to your whereabouts by displaying your position on a map.